Marinated chicken mince wrapped in pastry with sweet chilli sauce. 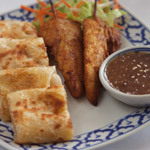 Combination of roti and satay chicken, served with satay sauce. Crispy fried chicken marinated in Thai sauce, pepper and garlic, served with sweet chilli sauce. 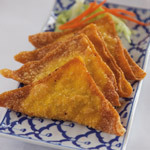 Serving of fish cake, satay chicken, curry puff, wonton and spring rolls. 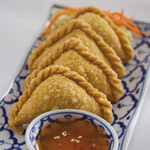 Prawn meat wrapped in pastry with noodle, garlic and diced vegetables, served with sweet chilli sauce. 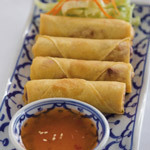 Thai chicken satay with fresh vegetables, sweet chilli sauce wrapped in roti bread. Marinated chicken on a skewer, with peanut sauce. 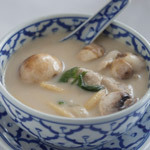 Creamy galangal coconut soup cooked with mushroom, bady corn, lemongrass and lemon juice. 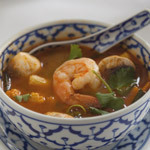 Spicy soup flavored with mushroom, bady corn, chilli, lemon grass and Thai herbs. 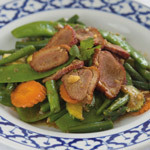 Stir fried choice of meat with oyster sauce and vegetables. 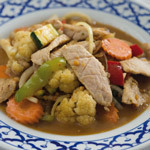 Stir fried choice of meat with special homemade peanut sauce and vegetables. 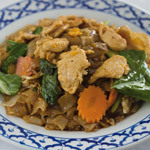 Stir fried choice of meat with Thai basil, chilli, garlic and vegetables. Stir fried choice of meat with garlic, pepper sauce and vegetables. 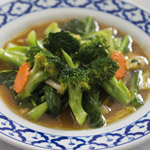 Stir fried choice of meat with ginger sauce and vegetables. Stir fried choice of meat with chilli paste and vegetables. Stir fried choice of meat with sweet & sour sauce and vegetables. 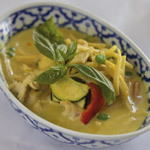 Green curry cooked with coconut milk and vegetables with your choice of meat. 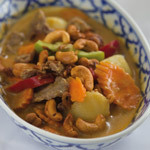 Massaman curry cooked with coconut milk, potato, shallots and cashew nuts with your choice of meat. 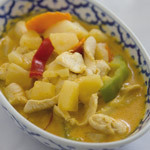 Red curry cooked with coconut milk and pineapple pieces with your choice of meat. Red curry cooked with coconut milk and vegetables with your choice of meat. Yellow curry cooked with coconut milk, bady corn and vegetables with your choice of meat. 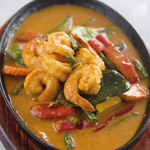 Tasty Panang curry cooked with coconut milk and vegetables with your choice of meat. 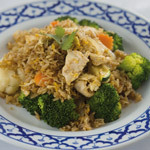 Thai style fried rice and vegetables. Spicy stir fried with flat rice noodles, basil with fresh vegetables. Stir fried flat rice noodle, soya sauce and chinese broccoli. Stir fried rice noodle with egg in a tamarind, bean shoots and peanuts. Combination meat Thai style fried rice and vegetables. 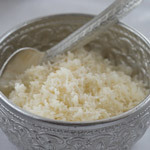 Finely chopped chicken or pork mince with rice tossed, dried chilli, red onion, mints and lemon juice. 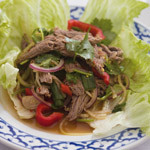 Spicy tradittion thai salad with beef or chicken, fresh chilli, lemon juice and vegetables. Spicy Thai salad with lemon juice, coriander and snow peas. Glass noodles mixed with chicken or pork, Thai herbs and lemon juice. 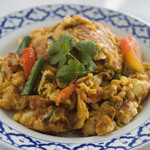 Thai omelet prawns, spring onion and tomatoes. 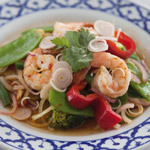 Spicy prawns with sour sauce, lemongrass, lime leaves, galangal and vegetables. 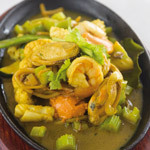 Stir fried seafood (prawns, calamari, scallops and mussels) cooked in yellow curry, celery and vegetables. Stir fried duck with garlic, pepper sauce and vegetables. Peanut Sauce available for $1 from the EXTRAS tab.